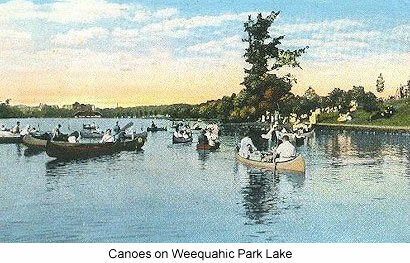 I recall Weequahic Park in Newark as a great sports place, in the era from the mid-1930s up until World War II. I had been a sports writer for the Newark Ledger/Star-Ledger, starting around 1937 as a high school correspondent and working up to a by-line reporter by 1940. As time evolved in my sports writing career, I graduated into coverage of more than a dozen different types of amateur and professional sporting events in Newark, from boxing and wrestling to polo and squash rackets tournaments, with many of them taking place at Weequahic Park. 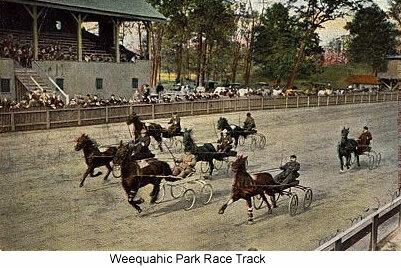 Among the sports I covered for the Ledger at Weequahic Park were track and cross country meets, the Saturday harness racing programs of the New Jersey Road Horse Association on the park's half mile dirt track, and the Sunday morning bicycle racing programs of first the Bay View Wheelmen and later the Alpine Wheelmen. I also covered on a number of occasions the New Jersey Canoe Regatta on the 71 acre Weequahic Park lake. Although I did not report on them for the Ledger because the activities were not competitions, there was also tennis on the park's tennis courts, and golf on the park's then nine-hole golf course. In the winter, the Weequahic Park lake would freeze up and would attract ice skaters from all over the city. I did my first ice skating on the lake in a brand new pair of Frick and Frack ice skates. Frick and Frack were stars of a traveling ice extravaganza and the skates were named after them. Of the many sports events I covered at Weequahic Park, one stands out strong in my memory. It was a National Catholic Interscholastic Track and Field Championship meet on the Weequahic Park race track. I wasn't aware at the time that I would be facing trouble. When I approached the meet chairman for the results of the events and told him I was from the Star-Ledger, he called the Park Police and had them evict me from the track meet area. I had to go to the Newark Evening News reporter, Stanley Groupy, later that day to get enough information to write my Star-Ledger story. I learned that night that the track meet chairman, a coach at Good Counsel High School in Newark, had a feud with the Star-Ledger sports editor, Joe Donovan. That was in the late 1930s. 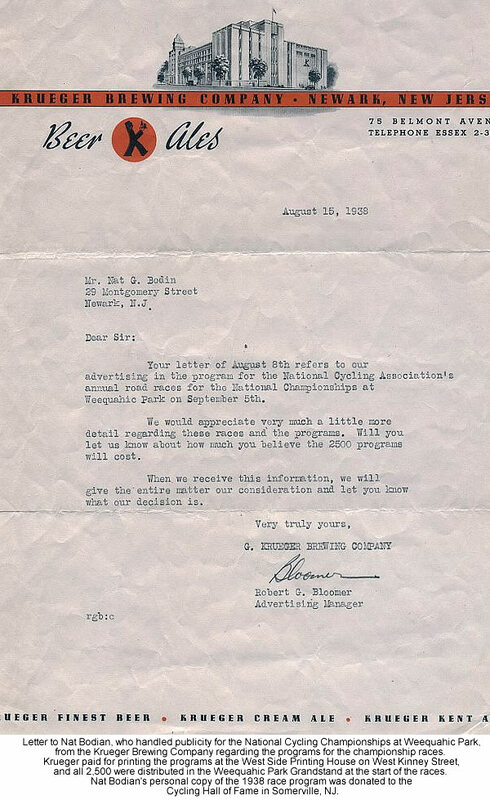 In 1938, the National Cycling Association's annual National ChampionshipsNational Championships were held at the Weequahic Park racetrack on September 5th, with its Newark affiliate, the Bay View Wheelmen as the host sponsor . I handled publicity for the event, which filled up the grandstand1 at the track. I gave the Krueger Brewing Company of Belmont Avenue an ad on the back cover of the program for the event and they permitted me to have 2,500 programs printed at their expense at their printer, the West Side Printing House on West Kinney Street. 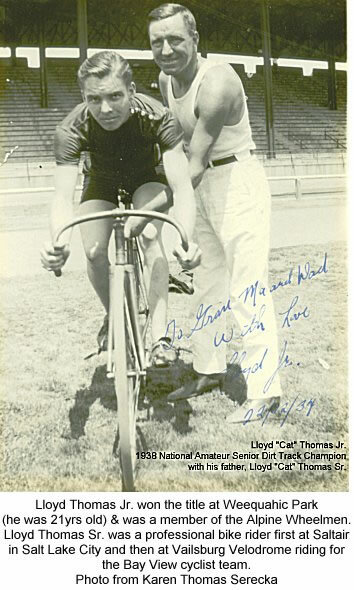 In 1940, two Bay View Wheelmen bike riders qualified on the Weequahic Park race track in the state eliminations and went to Chicago to represent New Jersey in the U.S. Cycling Olympics, also sponsored by the National Cycling Association. The riders were Jack Throckmorton and Fred Graef. 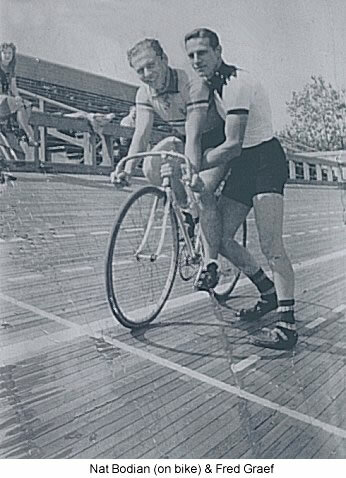 Neither made the finals on the banked board track of the Humboldt Park Bike Bowl, but Graef later won the 50-mile Olympic road championship on the streets of Chicago. I traveled to Chicago in the same car with the two New Jersey riders, shared a hotel room with them at the Midwest Athletic Club, and wired a story back to the Star-Ledger when Fred Graef won the road Olympics. After most sports events at Weequahic Park, participants would often refresh themselves at either of two hot dog establishments just outside the main entrance to Weequahic Park on Meeker Avenue--Millman's or Sabin's. A typical order was "one with the works." That meant a hot dog with mustard, relish, and sauerkraut. The counterman would ask you "sweet" or "hot" ? and you would have your boiled hot dog handed to you on a soft roll coated with a layer of sweet or hot relish, whichever you requested. Weequahic Park's paths were a bit uneven for roller skating. However, for those who liked to roller skate, there -- just off the far side of Weequahic Park, on Frelinghuysen Avenue -- were two roller rinks, the "New Dreamland Arena" at 985 Frelinghuysen on the Newark-Elizabeth border, and across the street on the Elizabeth side of the border, Twin City Arena. 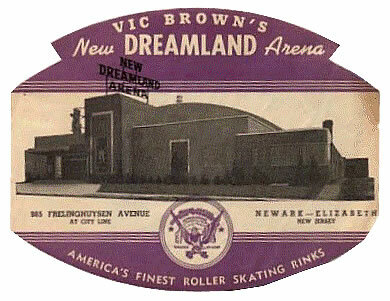 The New Dreamland Arena at 985 Frelinghuysen was considered the premier roller arena in New Jersey and had a substantial following, largely family trade, and well behaved skaters. It had professional organists for music and a crackerjack professional staff to maintain order and to teach. The staff top professional was Betty Lytle, billed as "America's Only Silver Medalist." Weequahic Park in Newark will arouse warm memories for many Newark old-timers, whether for the many sports events they attended or participated in, or as a family recreation center for young and old.